Well I’ve been super busy preparing for the book launch at Liberty tomorrow as well as working on client projects, having meetings and juggling the school run! 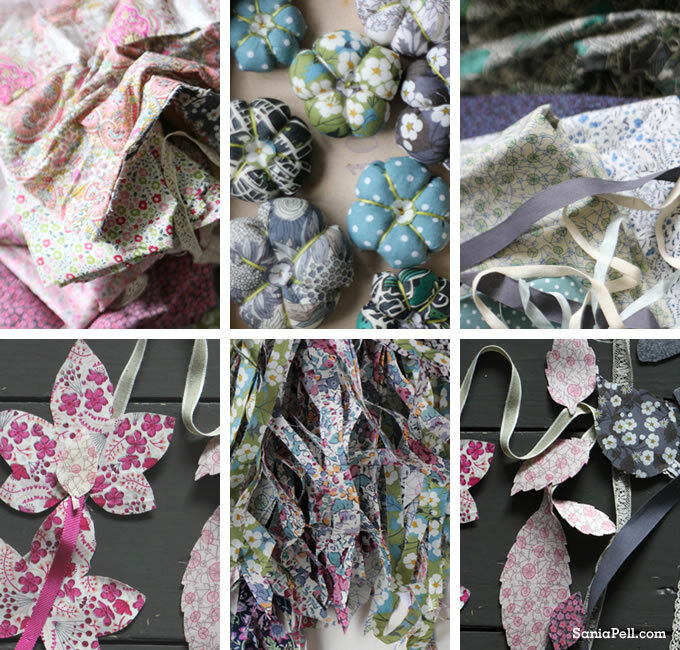 My studio is covered in gorgeous Liberty fabrics which I have been cutting and making into things to display or preparing ready for you to make with. It’s going to be a kind of ‘make and meet’ to celebrate the launch of the The Homemade Home for Children and I will be there between 2pm and 5pm on the 3rd floor near the entrance to Little Liberty. You will be able to join in the fun and make a Liberty print hair clip or brooch to take away with you or make your wishes come true by adding a wish tag to the wish board. And rather than doing a talk I am keeping it informal and will be there to show you how it’s done and help you have a go, and we can happily chat away while we make. So if you have any queries about projects from the new book or from my previous book or any other questions do ask. I will also be taking along some of the items to display like the floral banner that is on the cover, the play sail and other projects which you can photograph if you wish. Copies of the book will be available to buy from Liberty and if you would like me to sign your copy just ask. The invitation and details are on this link and if you haven’t visited Liberty before a map is here, it is a wonderful emporium so do browse the rest of the shop when you are here, it’s fab and you won’t be disappointed. I do hope you can come along and say hi, or if you can’t make it but know someone who can please tell them about it. The more the merrier. 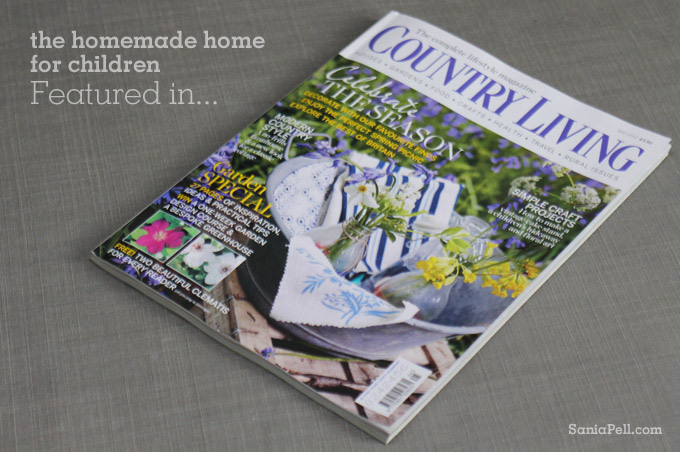 If you would like another peak into my new book, pick up the new May issue of Country Living magazine which contains a six page feature called ‘Get Creative’ with projects from The Homemade Home for Children. 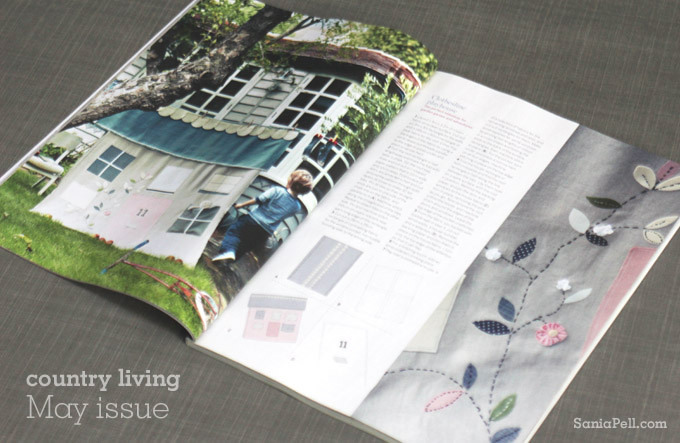 If you haven’t seen the magazine it is a complete lifestyle magazine and includes homes, gardens, food, crafts, health and travel. 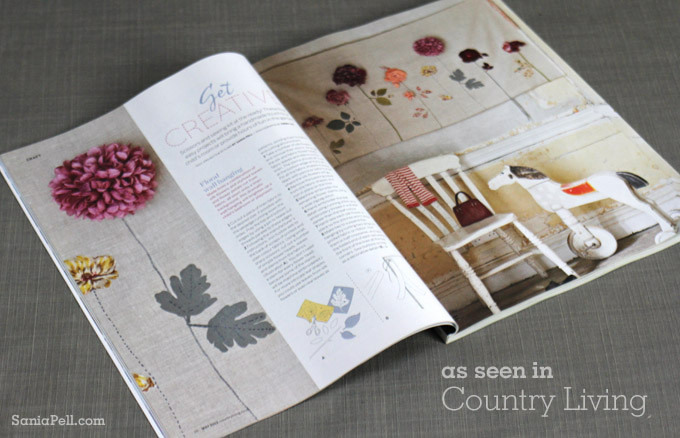 A big thank you to the Country Living team for the feature. Things are hectic here as I have been busy preparing for my book launch at Liberty this Thursday and my house is covered with swatches of Liberty print fabric and other goodies in anticipation! More details of the launch are here. I do hope you can come along! 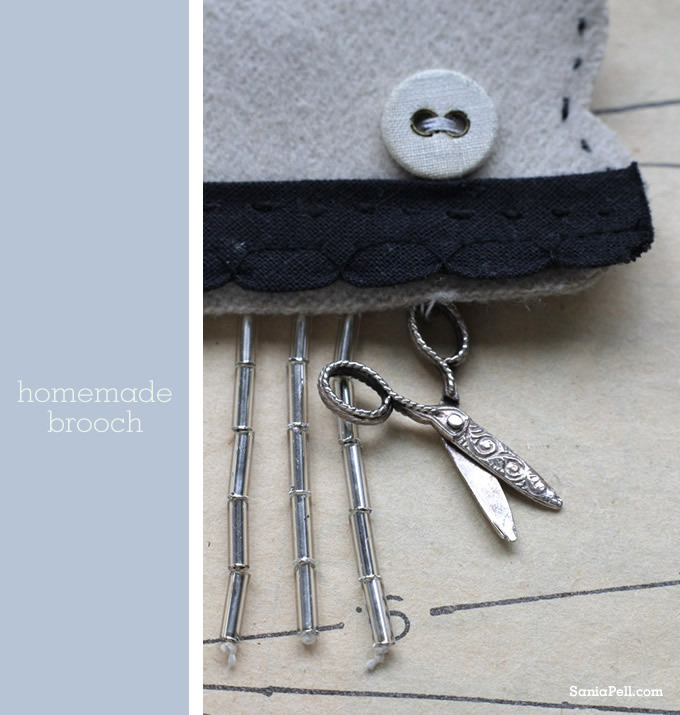 This is a favourite brooch of mine that I made and wore at the Decorate book launch last year in April. I was intending on wearing a high street brooch I had bought from Hoss (a favourite store of mine), but decided the day before the launch that I should wear one that I had made rather than bought. 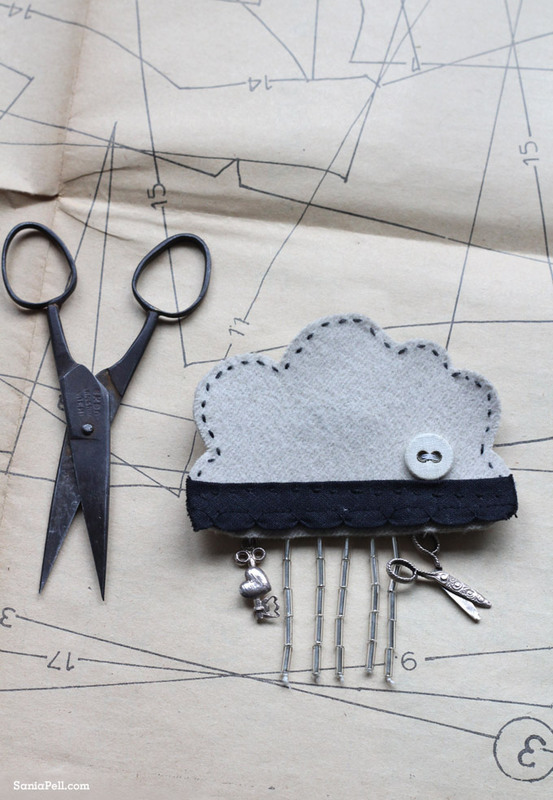 So I got busy and made this little felt cloud brooch. The silver scissors and heart key charms were lucky finds at Sunbury antiques fair in Kempton and are little surprises amongst the glistening silver beads of rain. The scissors open and shut and are really quite special. 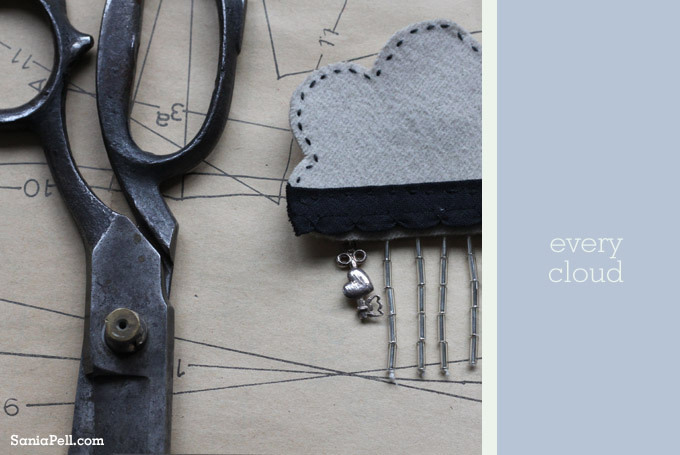 There is an embroidered felt brooch project in my new book and the rain cloud motif also features in a project too. Both projects have full step-by-step instructions on how to make them if you want to try this at home. If you love jewellery you might also like this post. Wearing a homemade brooch on your clothing is something that people always notice, and, as I wrote in my first book, there is nothing like the feeling you get when someone remarks how much they like something and you can reply “I made it”. My book launch… at Liberty! I have some wonderful news about my book launch… it is to be hosted in my favourite shop – Liberty! I feel very privileged to be having my book launch at Liberty and it is a dream come true. I have been a fan of Liberty since I was at school and I used Liberty print fabrics in projects in both my first book and my new book so the match is perfect. Last year I helped my friend Holly Becker with the Decorate book launch in Liberty which was such a fun event (see here and here), but I never thought at the time I would have one there too. One year later and a full circle has turned, I will have my book launch there with friends to help me celebrate too. And I would love you all to come along! It is on Thursday 26th April from 2pm until 5pm and we will have a couple of craft tables with simple projects from the book for you to make. I will also have some of the finished projects from the book on display and will be signing copies of the book which will be available to buy from Liberty. 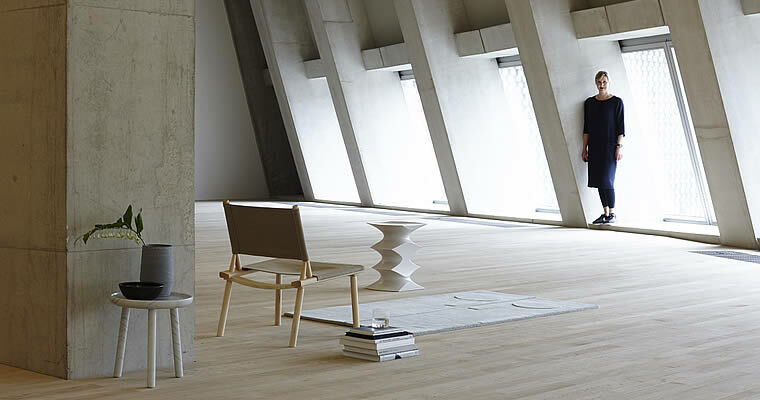 Of course it also gives you the perfect excuse to wander around Liberty’s gorgeous store! If you would like to come along please RSVP by email to Liberty (see the invite above) so that we can gauge numbers as places will be limited on the craft tables. I do hope you can make it and looking forward to celebrating and meeting you there. I can’t wait! PS To keep up with the latest news on the launch please ‘like’ my Homemade Home Facebook page and you can also follow things on Twitter. This Saturday I had some time with my son at home. My husband took my daughter to a party, so with just the two of us in the house, we had fun painting side by side on the kitchen table. We both share a love of drawing so it was a real joy to spend this time with him. I used my son’s drawings in the china transfer project in my first book and both of my children’s drawings appear in my new book on the wish board and the embroidered cushion projects. 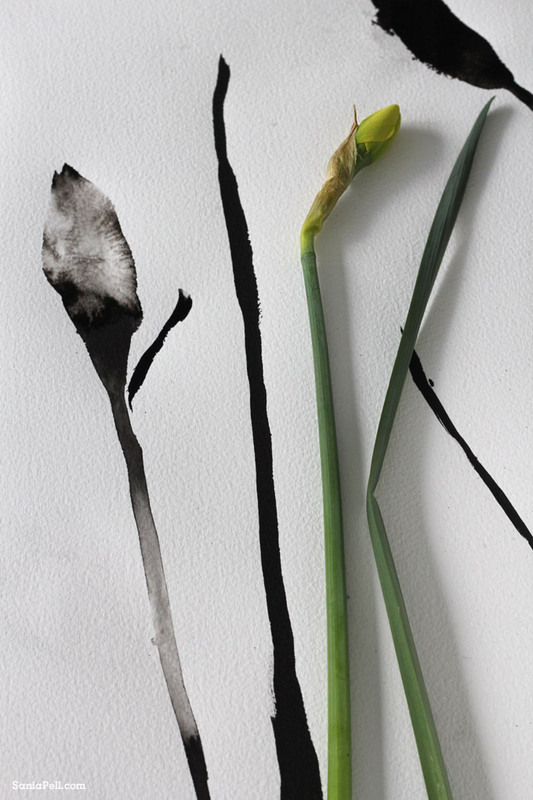 The ink drawings I made are reminiscent of designs I used to produce as a textile designer. I still love this type of free form sketching with paint and I wanted to show him some techniques. 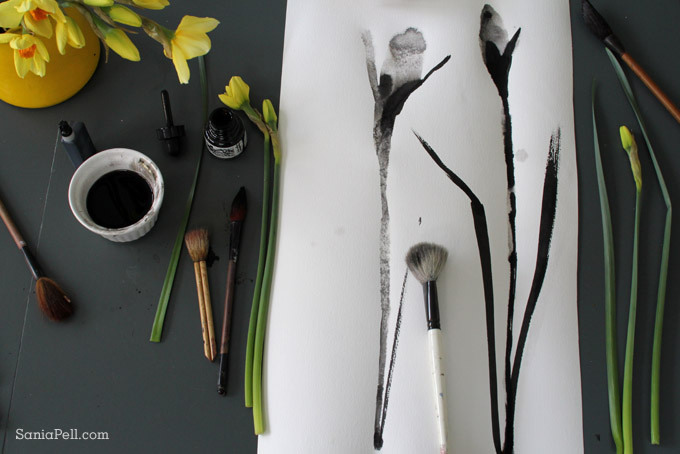 I had bought the Spring daffodils from my local florist the day before and he liked the idea of painting them using my Chinese brushes and just black ink. 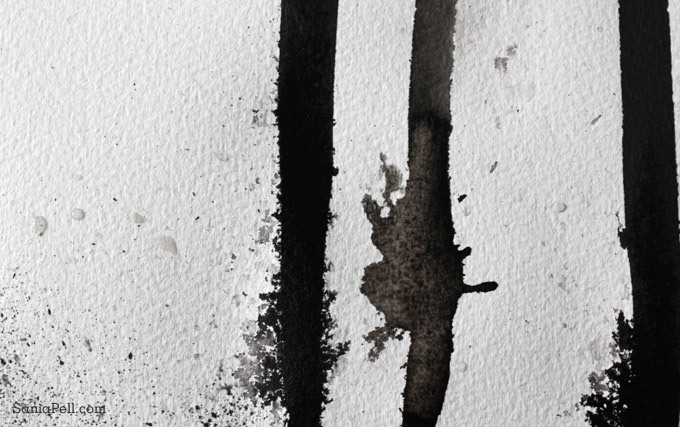 I love the simplicity of jet black ink on cartridge paper, the marks, splatters, drips and dribbles that come when working quickly and freely. 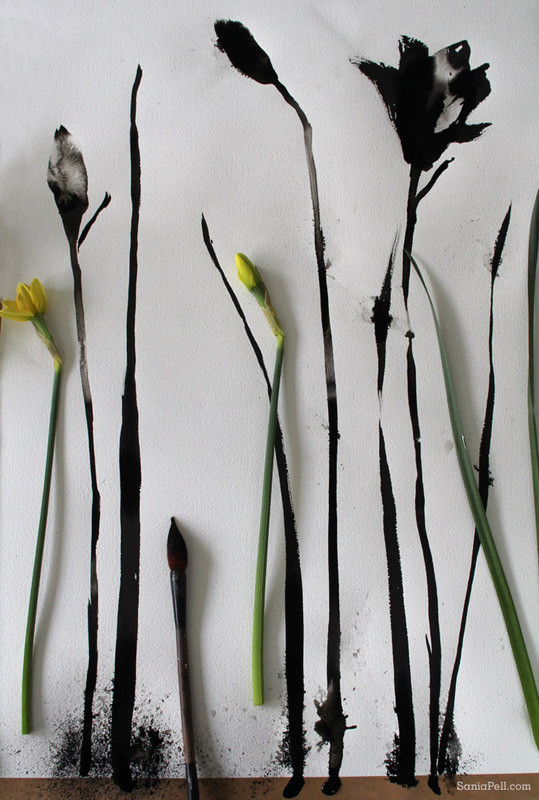 If you like this post, you may also like these floral paintings. We had an hour or so drawing, chatting and sharing a love of creativity. 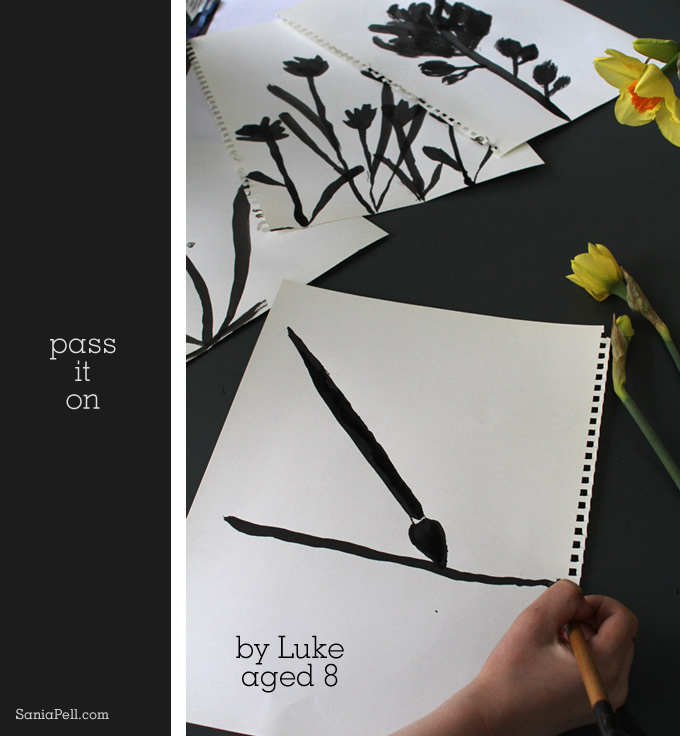 He produced some really lovely flower paintings, they are all his in the photo above. 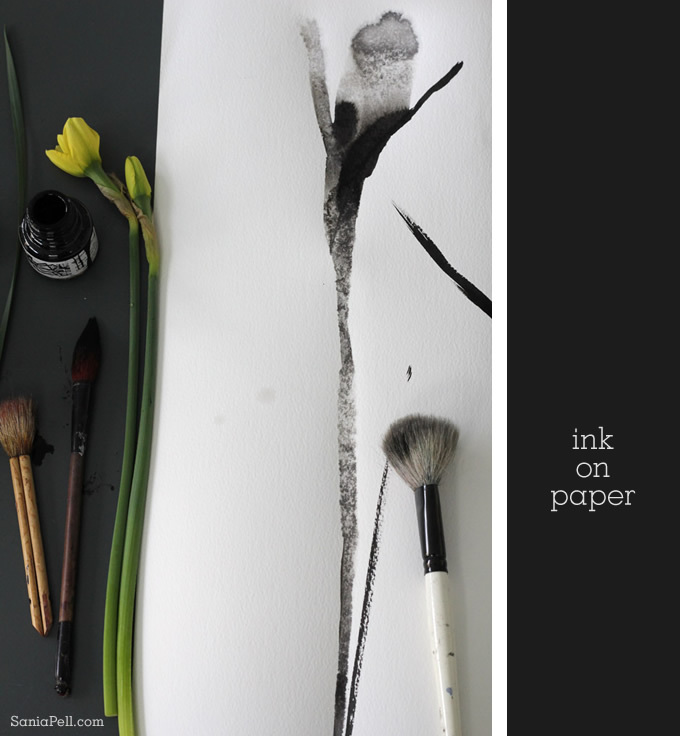 My favourite is the ink illustration of the paint brush he was holding to create it – his own little joke. This will be added to the little recess in the kitchen used to display the children’s art. Is there a shared creative hobby or interest your children and you share? I wanted to share a little post to celebrate Easter and Spring time. With a few days off from work and the school run I managed to take lots of new photos. I took these pictures on Easter Sunday when the dinner was in the oven and the children were playing quietly in the other room, I hope you like them. 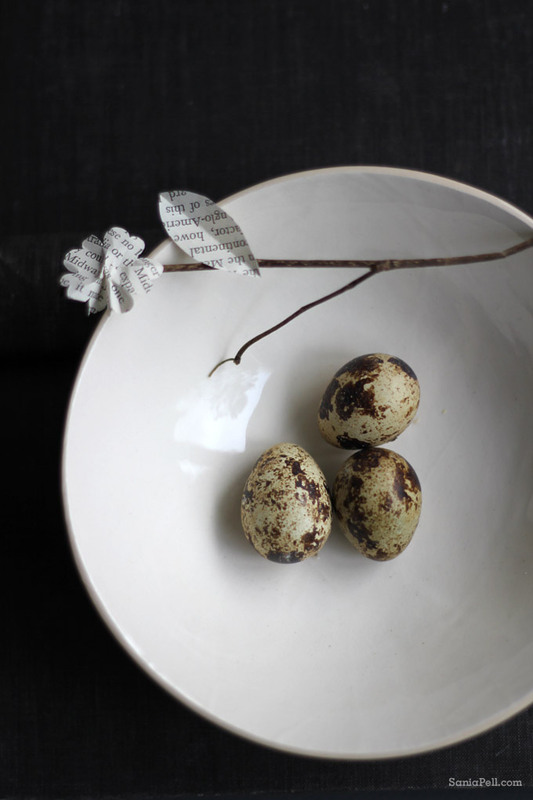 As a child I always decorated plain, hard-boiled eggs with my mum and brother at home on the day before Easter and since then have always associated eggs with Easter (and no, not just the chocolate variety!). These patterned eggs reminded me of those times. As I prepared dinner I watched two tiny robins in my garden. They were busily flitting back and forth to feed their chicks in a nest in my hedge. 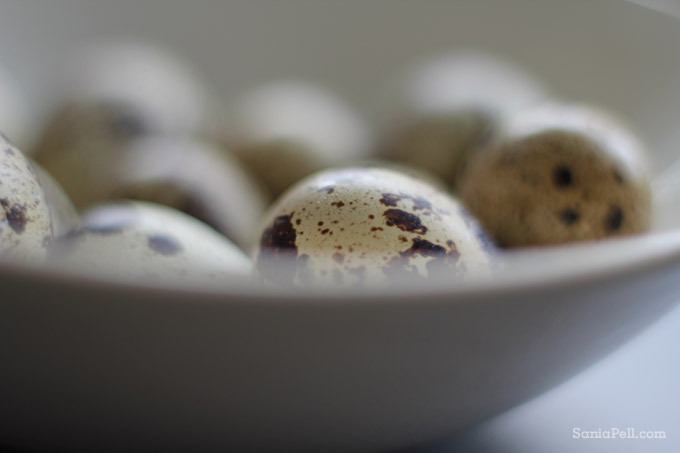 This got me thinking in a different way and reminded me I had these beautiful quail eggs in my fridge. I had come across them in my local Waitrose and couldn’t resist buying them with their unique, natural patterns. 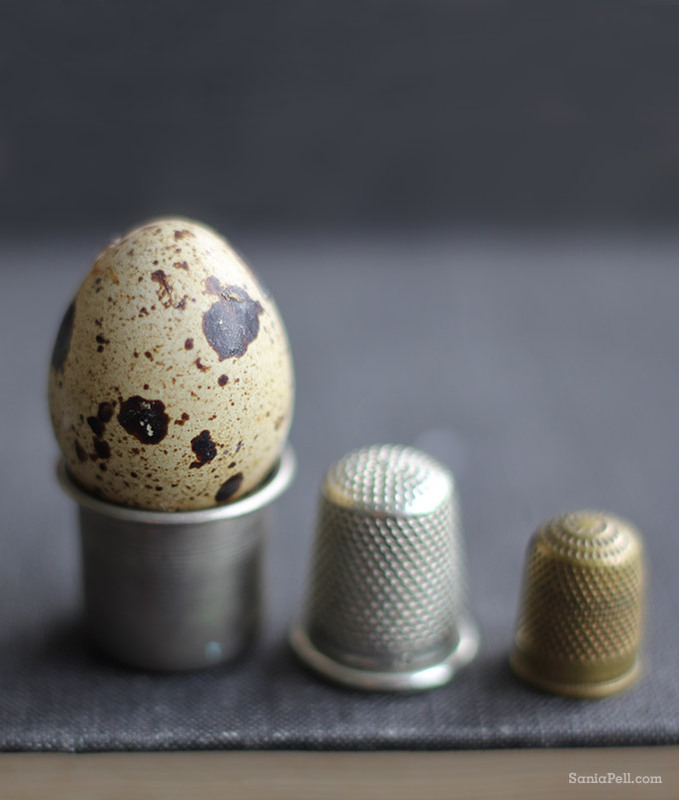 They were so small I wondered if a thimble could be used as an egg cup. As an avid collector, I have several vintage thimble varieties and one fitted perfectly. And so my little photo story began. I grabbed my camera, a few props and spent half an hour trying different arrangements and taking photos. 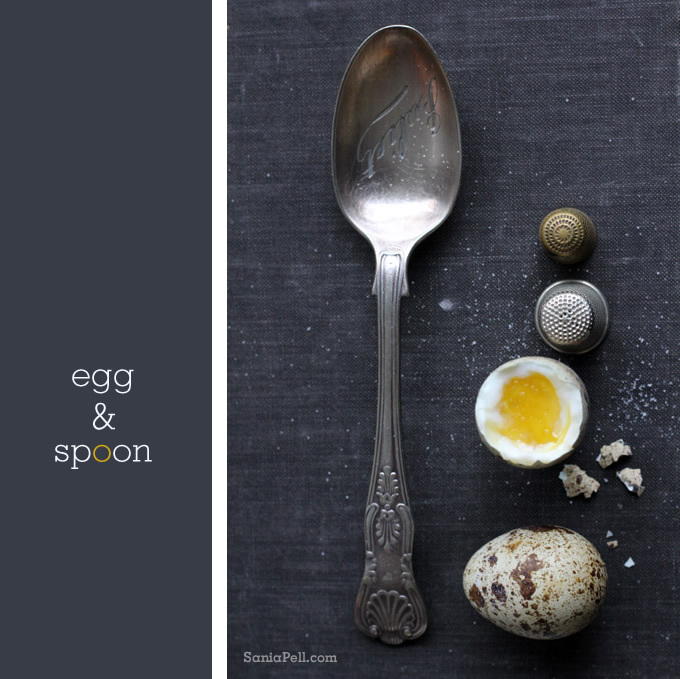 I cooked one as a soft boiled egg, rested it in an up-turned, flat-bottomed thimble and sprinkled some salt on top. It just needs some mini toast soldiers to dunk in and a tiny spoon! 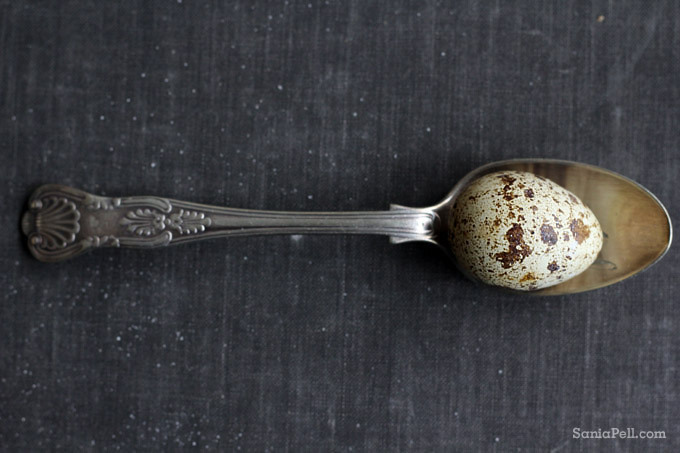 The silver spoon in the photos was my British grandmother’s and is a treasured possession and favourite prop. The vintage thimbles I picked up over the years from my Croatian grandmother and flea markets. 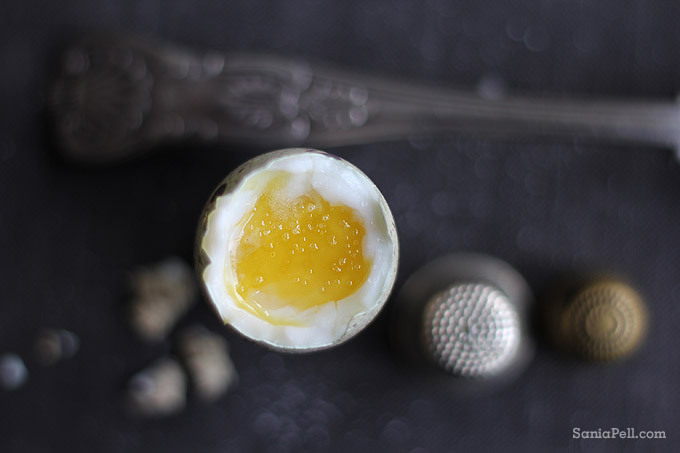 They almost look like mini salt shakers to go with the mini eggs. The white bowl is by Brickett Davda whose gorgeous ceramics I love. Another collection I have slowly been feathering my nest with. After taking the photos I cleared away and got back to feeding my own two little chicks. 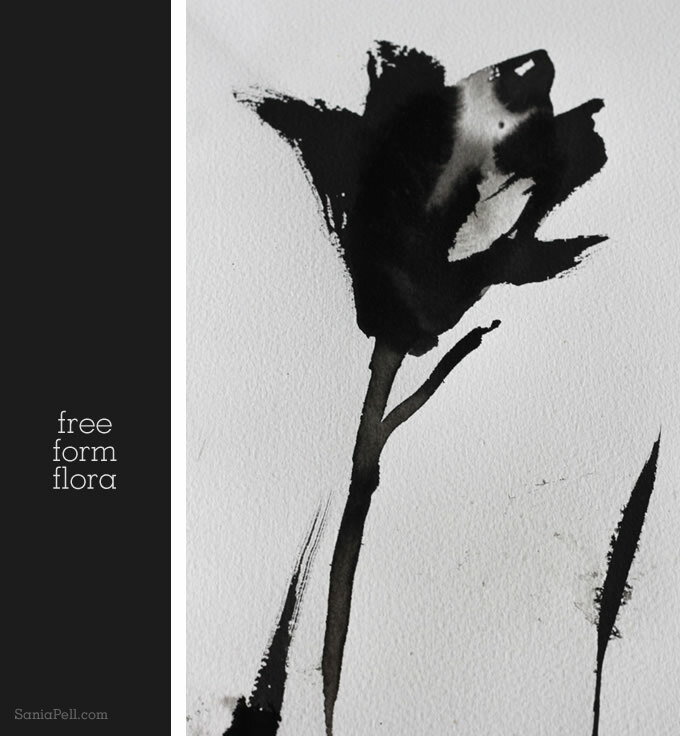 Thank you to Rona Wheeldon who interviewed me recently for Flowerona, a blog for all things floral. Read the interview here. And thank you also to Ursula of children’s interior design blog Room To Bloom who posted the first review of my new book yesterday. Read the review here.